Value-priced rooms with free Wi-Fi and continental breakfast are perks available at Best Western the Inn of Los Gatos. At the two-story hotel 62 exterior-access rooms come with cable TVs free Wi-Fi coffeemakers mini-fridges ironing equipment and hairdryers and non-smoking rooms can be requested. The hotel serves a free full breakfast. Get work done in the business center work out in the gym and cool off in the heated outdoor pool. Parking is free. 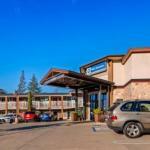 The hotel is less than a mile from Highway 17 and within walking distance of downtown restaurants and boutiques. Many San Jose businesses are within a 15-minute drive. Guests can take a scenic 30-minute drive over the Santa Cruz Mountains to reach the beaches of Santa Cruz and Capitola or explore the coastal towns of Monterey and Carmel-By-The-Sea both about an hour away. Norman Y. Mineta San Jose International Airport is 12 miles north.